Intermatic 2-Pole Mechanical water heater, timer switch with 60 mins timing, has voltage rating of 208 - 250-Volt AC at 60-Hz and resistive current rating of 40-Amps. Timer switch has a dimension of 5-Inch x 3-Inch x 7-3/4-Inch. It comes with three sets of ON/OFF trippers and includes a NEMA type-1 enclosure. 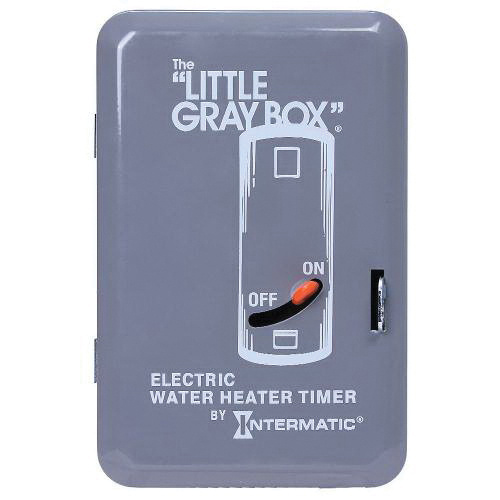 This gray colored timer switch features drawn steel construction and supports keyhole mounting. It has temperature rating of -40 to 54 deg C. This timer switch is great for residential, institutional, industrial, commercial, military facilities and schools. Timer switch is cCSAus certified and cULus listed.